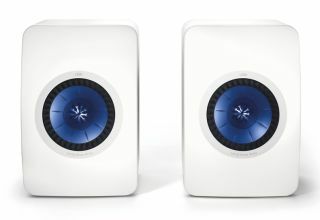 Award-winning KEF LS50 speakers now available in gloss white | What Hi-Fi? We've long been big fans of the KEF LS50 mini monitor - it was, after all, our speaker Product of the Year in 2012 - and so have our readers: it won our Readers' Award in 2013 and again in 2014. Previously you could only get it in black with a gold Uni-Q driver, but if that doesn't suit your taste or decor, there's now a white version. The blue or gold Uni-Q may look like a single unit, but it’s really a 25mm aluminium dome tweeter in the centre of a 13cm magnesium/aluminium–coned mid/bass driver. The cabinet's curved front panel is made of DMC (Dough Moulding Compound: a polyester resin combined with glass fibre and calcium carbonate), chosen for its mass and inertness, while the rest of the enclosure is made from MDF. The original LS50 was designed to celebrate KEF's 50th anniversary in 2012.